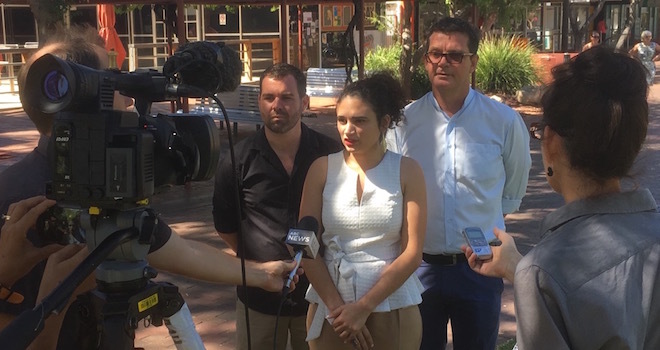 Above: Minister Lauren Moss, flanked by Chansey Paech, Assistant Minister on the project, and Philip Watkins speaking to the ABC and Alice Springs News Online. No other media were present despite the national Indigenous gallery being the “centrepiece” of the Gunner Government’s plans for Alice Springs. An initial six-month community consultation about the Territory Government’s project to build a national Indigenous art gallery will be headed by two prominent Aboriginal Central Australians, Hetti Perkins and Philip Watkins, as co-chairs of a steering committee. Tourism and Culture Minister Lauren Moss made the announcement today. Hetti Perkins has a national reputation as a curator, writer and consultant. She was the senior curator for Aboriginal and Torres Strait Islander art at the Art Gallery of New South Wales for 13 years, and has been calling for a major stand-alone national Indigenous art space since her resignation from that position in 2011. Philip Watkins is Chief Executive of Desart, the support and advocacy body for Central Australian Aboriginal art centres. He was formerly artistic and cultural director of Tandanya National Aboriginal Cultural Institute in Adelaide. Ms Moss described the national Indigenous art gallery as the “next real game-changing project” for Central Australia. She said the steering committee will conduct initial consultations with “the local and national community” on things like a governance structure for “a gallery of this significance”, the possible leveraging of private and government funding for the project (beyond her own government’s future pledge of $50m), possible locations, and plans for future community consultations. In relation to location, she said the government would be making sure that the project revitalised Alice Springs, but they also want it to disperse visitors across the region (the art trails concept, from here to East Arnhem). She would not be drawn on the timing of the international design competition, which the Chief Minister has said will be launched this year. She confirmed that the government’s intention for the gallery is to tell the story of Indigenous art across the country: this is the sense in which it will be national as well as “nationally significant”. In 2014, at the opening of Desert Mob, Hetti Perkins spoke of work underway in Alice Springs on a repository of “our art for our mob”. The next day, at the Desert Mob symposium, she made brief mention of the need for a “series of regional institutions devoted to the collection and exhibition of Aboriginal and Torres Strait Islander art”. Mr Watkins said he is confident there will be support in Indigenous arts communities for a gallery of significance to be here in Alice Springs, as recognition of the significant contribution of central Australian arts to the national arts landscape. National Indigenous gallery: what should come first? “In all recent Government media, no mention has been made of the $20m Cultural Centre, only the $50m Art Gallery,” says Mrs Lambley. 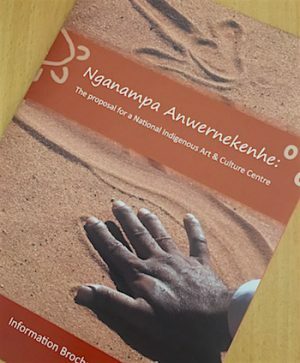 Left: The information brochure produced by Nganampa Anwernekenhe, a group outside of government, about their proposal for a “National Indigenous Art & Culture Centre”. “It is concerning the Northern Territory Government has stopped talking about the $20m National Indigenous Cultural Centre for Alice Springs. Questions need to be answered about this Government’s full commitment to both major projects that are strategically linked . The original plan was that these two projects be combined to form a truly iconic National Indigenous centre, showcasing both art and culture. MLA Chansey Paech, Assistant Minister on the national Indigenous art gallery project, recently told the Alice Springs News Online that the cultural centre is being promoted separately by a group outside of government, Nganampa Anwernekenhe, chaired by Harold Furber. He said the government is supporting that work with a $20m commitment and is open to the possible co-location of the centre with the art gallery. The News has been in touch with Mr Furber about Nganampa Anwernekenhe’s plans, but to date he and the committee have not been ready to have a public discussion. Specifically on Mrs Lambley’s comments today, Mr Furber declined to comment. The News has asked Minister Moss for comment. We will post it when it comes to hand. “I welcome Robyn Lambley’s interest in Territory Labor’s election commitment to deliver an iconic national Indigenous Cultural Centre as this project will deliver jobs and provide a huge boost to Alice Springs . “The Government remains fully committed to the delivery of both the iconic national Indigenous Cultural Centre and the iconic national Indigenous Art Gallery in Alice Springs with each project set to boost tourism numbers and create jobs. “The Nganampa Development Corporation has been engaged to undertake preliminary consultation for the Cultural Centre. The Nganampa Development Corporation is well respected and very capable of handling this consultation process. “Nganampa Anwernekenhe has already completed some work in this area, including researching and visiting Indigenous cultural centres nationally and internationally. “The government has provided provisional support by way of $108,500 (plus GST) in funding to Nganampa Anwernekenhe to carry out the consultation and has seconded an officer from the Northern Territory Government for six months to assist with facilitating the process. Art and culture are often linked, as evolution of one’s culture can be seen throughout the arts. However this said, I prefer a Cultural Center to an Art Gallery, the latest having a more private business sound to it. Art Gallery? I thought it was going to be a cultural centre, showing all aspects of Indigenous culture, not just the bits they can make money from.